Science Book of the Year 2011 USA Best Books Awards. 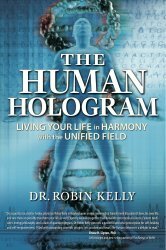 "Reading Dr. Robin Kelly's book The Human Hologram was a surprisingly easy and affirming experience. His loving nature and profound respect for Life reflects off every page. It's accessible on every level and stirs a lot of personal thought. I hope you'll read it and provide some comments for a lively discussion. It's not everyday you can see Western and Easter medicine enmesh so neatly, so completely, and so hopefully, too!" For an in depth interview with Robin Kelly on The Human Hologram, click here. What if our physical bodies were perpetually being formed upon an invisible field of information? And what if this field was one vital and integral part of the same field underlying the physical structure of our universe, holding all the information and wisdom of its past and present? And what if, by being a knowing contributor to this field, each of us could create a blissful and peaceful future not only for ourselves and our planet, but for our whole universe? If we are indeed, at the deepest level of our being, truly holographic - these questions may no longer be regarded as far-fetched. Dr Robin Kelly, author of the award winning The Human Antenna, explores these mind stretching concepts and speculates exactly how our developing awareness of ourselves as Human Holograms will affect every aspect of our future on this planet.He guides us into how we can best use this information here and now to transform our lives, and to achieve optimum health.